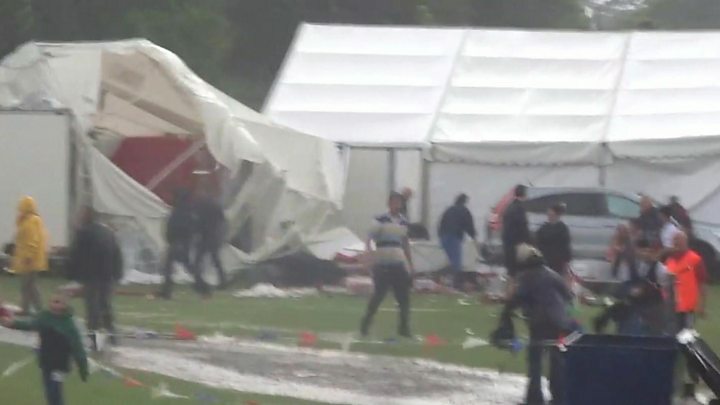 A Highland Games in a north-east village had to be abandoned after a "mini tornado" swept through the site. Villagers in Cornhill, near Banff, had been enjoying the annual event at the playing fields on Saturday afternoon. 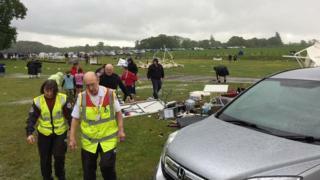 After a spell of "beautiful" sunshine, the storm blew in, wreaking havoc on the park and lifting the first aid tent over a marquee and into the arena. No-one was seriously hurt, but the games secretary Shona Hay said the noise was terrifying. "Ten minutes before this we had a beautiful sunny day," she said. "It was just torrential. Everybody ran for cover and a wind seemed to appear from nowhere and lifted our first aid tent and some of the stall holders' tents. "And then the noise was just terrifying - the noise of the wind and the folks screaming." She added: "The wind just swept through the park tearing up the tents, just clearing the arena and everything in its path. It swept through the village and five minutes later it was flat calm again."